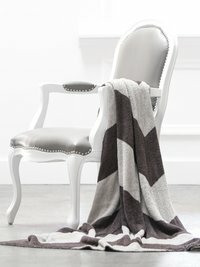 Cozy up in style with our silky feather yarn throw in a bold chevron design. Knit with LOVE, the Dolce™ Chevron Throw is the perfect accent to warm up your living space. can't even explain how great this blanket is. my daughter even brought one of ours to college with her...makes any set up (even a dorm room) a luxurious and cozy space! I highly suggest this for anyone who is looking to get a fully functional throw for their bedroom or living room! So soft and cozy AND beautifully made. Also the best gift you could give or receive! Softest blanket in the world, I'm always cuddled up in it and I love the design!